Then again Alabama has had a long and convoluted governmental history, so maybe it’s not so surprising. 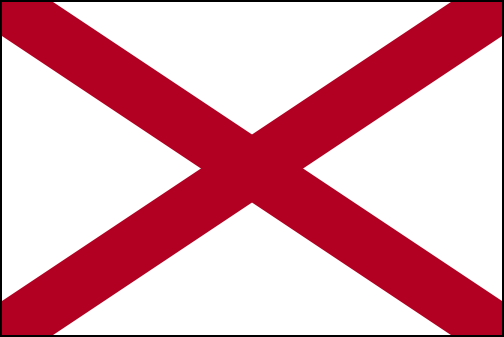 So as The Legal Genealogist continues the occasional series on primary law around the United States, let’s start with the fact that border disputes were the name of the game in what became Alabama starting way back in colonial days. As the 20th century dawned in Alabama, demands to redraw the basic framework of state government grew. The “Redeemer Constitution” of 1875 had effectively wrested political control from the coalition of Republican “scalawags” (native Republicans), “carpetbaggers” (Northern opportunists), and newly freed blacks who had briefly held power during Reconstruction. However, its limits on state support for commercial development through river improvement and railroad construction, and its low tax ceilings which kept schools poor increasingly drew criticism from reform-minded Alabamians. Of greater importance to the politically powerful was the need to better control who voted in the state, a legacy of the tumultuous 1890s when the conservative Democrats were challenged by the Farmers’ Alliance/Populist movement. The entrenched “Bourbons” had maintained control during that period through a combination of intimidating African Americans, raising the specter of “black rule” to keep whites within the party, and fraudulently counting votes for conservative candidates when all else failed. Uncomfortable with the turmoil and subterfuge of these campaigns, many leaders of the conservative Democrats embraced calls for a new constitution as a way to ensure “honest elections” — by legally taking the vote away from blacks so that they would not have to be stolen. Closely contested elections saw a convention assembled and a new Constitution adopted in 1901. Generally supported by the conservative “Bourbon” planters of the Black Belt counties and their allies in the rapidly industrializing Birmingham area, both the convention and the proposed Constitution had significant opposition from poor farmers and African Americans afraid of losing their already tenuous political identities. The resulting 1901 Constitution fulfilled their fears as a host of stringent suffrage restrictions effectively denied great numbers of both classes the right to vote. There have been, to today’s date, 827 amendments to the 1901 Constitution. • Constitution of 1901 (current) – click on the link for Constitution in the far left, then on View to display the provisions. Image: Public domain, via Wikimedia Commons. Fascinating post. This is very helpful, and I’ll have to flag this for later as I have some ancestors who migrated into Mississippi after 1803. I’d be interested in what states you look at next. My Jones family migrated into Tennessee before it was a state, and over time the territory where they were living was North Carolina, the State of Franklin and later Tennessee. So there’s a lot of borders and constitutional change to sort through there. I’ll get to all 50 eventually!